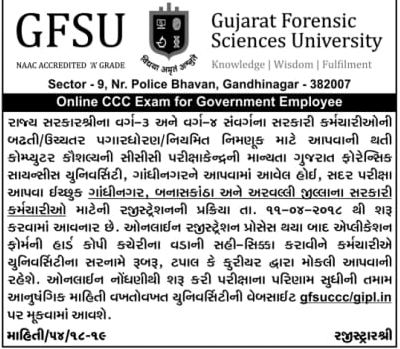 GFSU CCC Registration: Gujarat Forensic Science University released notification for GFSU CCC Registration. Government Class -3 & Class-4 employees may apply online on official website gfsuccc.gipl.in. Gujarat Forensic Science University published registration notification for CCC Exam. Government employees can apply GFSU CCC Registration Exam for get Higher Grade or Promotion during job. Gandhinagar, Banaskantha and Aravalli district employees may apply online registration on official website gfsuccc.gipl.in. Government employees who eagerly wait for online registration We also inform them to avoid their waiting, Gujarat Forensic Science University announced GFSU CCC Registration. Online registration will b start on gfsuccc.gipl.in. Candidates have to submit hard copy of application form to office address by courier or self or post. After the GFSU CCC Registration process completed, applicants have to submit hard copy of the application form, with the signature and stamp of the Head of the Office, will be sent to the address of the University, by mail or courier. For CCC Exam registration, Result and other information keep visited gfsuccc.gipl.in or gfsu.edu.in. Candidate have to go on official website i.e. gfsuccc.gipl.in.